Policeman is a Minifigures Series 9 minifigure released in January 2013. He will also appear in LEGO Minifigures Online. The policeman is wearing a dark blue police hat and he has a good-natured smile and black eyebrows. He wears a dark blue torso which has pockets and a black clip on tie he has blue arms and yellow hands and he has dark blue legs. This is the second Minifigures cop to be released, the first being the Traffic Cop. His bio mentions the Crook and City. His face is similar to that of Chase McCain. He has a same accessories as the Traffic Cop, but with a police ID instead of a speeding ticket. He also doesn't come with a pair of extra handcuffs. There’s no one more dedicated to catching bad guys than the brave Policeman. He may work out of the big city, but he’ll tirelessly pursue crooks no matter where they try to hide, risking life and limb every day while doing his duty to protect the public and uphold the law. Robbers may flee to the distant desert or the dense forest, but they’ll always hear the footsteps of the Policeman following behind them. And just when they think they’ve gotten away with the loot, there he’ll be with his shiny badge and handcuffs to arrest them and haul them off to jail. 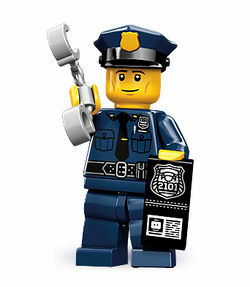 Break the law and beware: the Policeman always gets his Minifigure!"